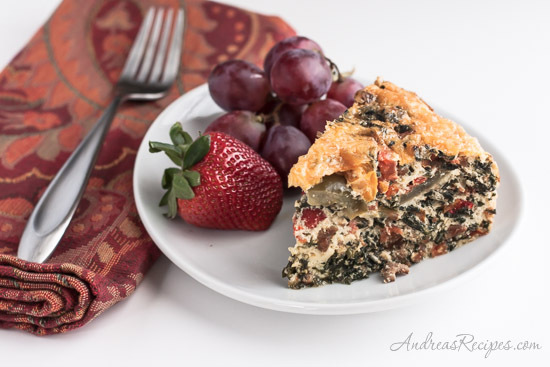 When it comes to savory breakfast casseroles and quiches, I’m not a fan of crust. Unlike my love of a good sweet pie crust, I want to just taste the fillings without anything surrounding it. And I like mine stuffed with plenty of vegetables, like this one. My sister shared this recipe with me last week, a healthy, low calorie breakfast casserole she makes once a week. The good thing about these kinds of casseroles, besides the flavor and the fact that it’s healthy, is that there are so many ways to vary the vegetables and have something different each time. This time I made it with spinach, some frozen bell peppers leftover from the summer garden, onions, and a couple chopped tomatoes, but you can add just about anything and it will still be good, and it’s easy to make gluten-free, too. For a weekend breakfast when you have more time, try sautéing fresh chard and using it instead of the spinach. Adapted from my sister, Angela Hayes. 2. In the skillet, sauté the sausage over medium heat until browned, about 10 minutes. Drain the sausage on a paper towel, then add the chopped onion and continue to cook over medium heat until the onion is slightly soft, about 5 minutes. 3. Add the drained spinach to the skillet and stir into the sausage mixture. Cook for about 3 minutes, until the spinach is warm. Add the chopped tomatoes and cook for another 2 to 3 minutes. 4. Pour the meat mixture into the prepared casserole dish, then add the liquid egg whites and top with the grated cheese. 5. Bake in the preheated oven until the cheese is browned and the egg whites stop bubbling, about 1 hour. Remove from the oven and allow to cool for about 10 to 15 minutes, then serve. Gluten-free: Use gluten-free sausage. My sister uses Jimmy Dean Turkey Sausage Crumbles. Other things to add: crushed red pepper, diced bell peppers, chili powder. Sauté fresh chard and use it instead of spinach. Fabulous Recipe!!! I enjoyed the flavors while you & Angela were here last week. Looks great! I love to have this type of thing in the fridge so breakfast is taken care of. Love the ingredienst and, of course, once you mentioned chard, you had me. That has to be the most versatile green on this good earth! Thanks for the recipe. Have a great day.